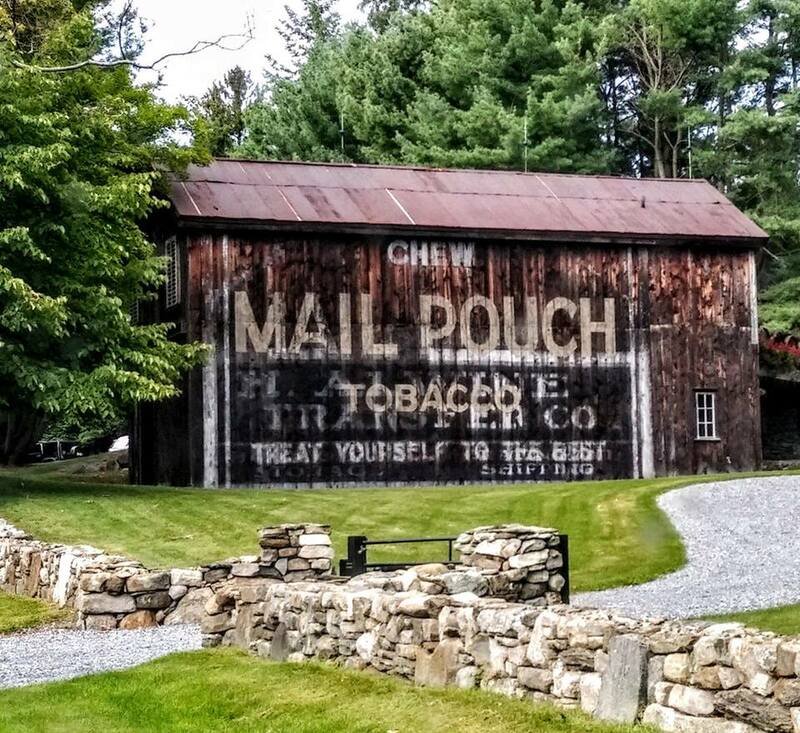 Last Sunday, I drove to Dutchess County to photograph one of the few remaining Mail Pouch Barn ghost signs left in New York. The barn is part of a private property estate, so as long as I stay on the side of the road, I can photograph the building without violating the many “NO TRESPASSING” signs that populate the property. Mail Pouch Barn, Dutchess County. BlackBerr KEYone cell phone. Photo (c) Chuck Miller, all rights reserved. 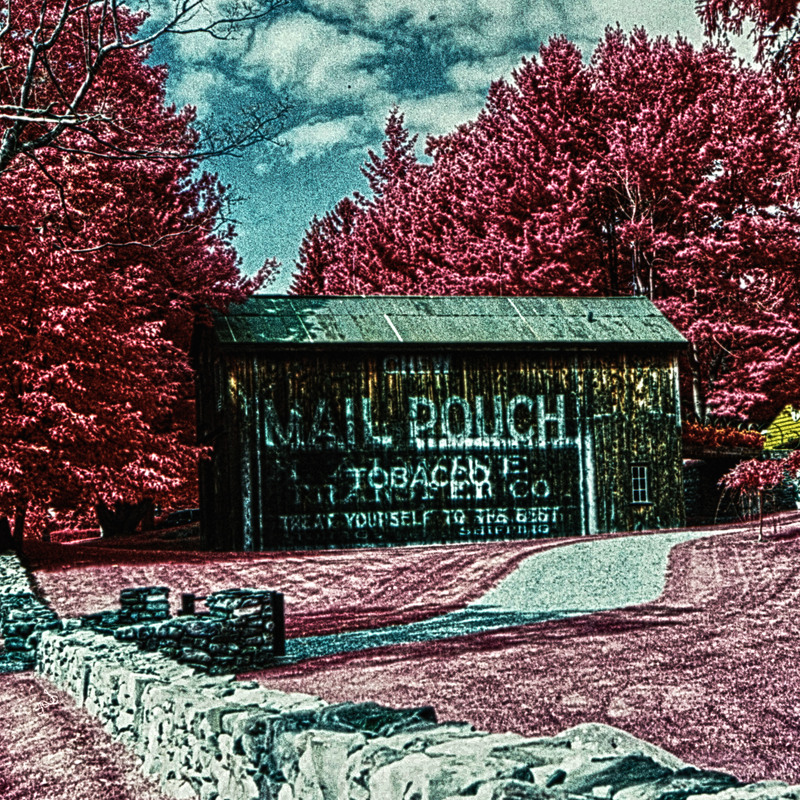 Of course, I want to photograph this barn with my infrared film. So I took a few shots and hoped for the best. That second advertisement is a clue that this barn – as beautiful as it is – is not originally built in Dutchess County. Heck, this barn may not even be a New York barn after all. Some archeological online digging rustled up a Lewis H. Alwine, whose family operated several businesses in Spring Grove, Pennsylvania. Alwine was owner or president of a brick factory, a knitting mill, and – this is the clue – a shipping company. So this barn was originally part of Amish country. The barn was relocated, plank by plank, to a 99-acre farmstead in Dutchess County, a farmstead owned by U.S. News and World Report / New York Daily News publisher Fred Drasner. According to a New York Post article, Drasner named the property Cantagree Farm, the name evolving from a dispute with his then-wife. At one point in time, Cantagree Farm had several buildings, a small petting zoo, a duck pond, a heliport and a giant wooden rooster. So maybe Drasner viewed the property as a recreation of an idealized farm of his youth, perhaps he saw it as a personal “heritage village” of some sort. I don’t even know if Drasner still owns the property. All I do know is that the property is private, and I’m not taking any chances by trespassing any further than the side of the street. But I did pull out the trusty Rolleiflex and shoot some infrared photos. Now I wait until they’re developed. Just got the call from McGreevy Pro Lab. They’re ready for pickup. And here’s what I captured. Mail Pouch Barn. Rolleiflex Automat MX camera, CIR color infrared film. Photo (c) Chuck Miller, all rights reserved. Well now … at high contrast, you can see nearly every single blade of grass! This photo looks absolutely surreal! I’m going to keep this one around for a while. In other words … this may work out for me in the future. Or it may be a gateway to an even BETTER photo down the road. But as we all know … the journey itself is part of the adventure. Awesome photo and very interesting article!